Turn this Family Reference Chart into refrigerator art! Consider laminating each chart and attaching with magnetic tape: Parents love this gift. Our ABC Phonics: Sing, Sign, and Read! 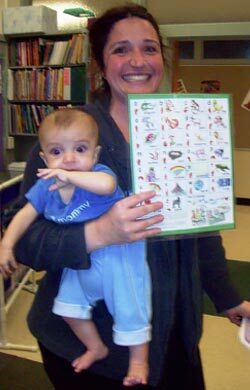 program makes it easy for parents to be partners in ABC and phonics learning. The quality online instructional videos provide strong support. Common Core State Standards stress the importance of building mastery of foundational reading skills. We want to do this in the most emotionally engaging and efficient manner possible: Singing and signing with Parents as Partners is the answer! 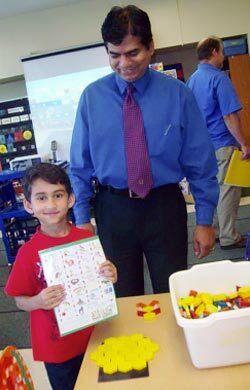 We introduced families to the parent component of our ABC Phonics Program the beginning of the year in several kindergarten classrooms. Within days we saw powerful results. Progress is accelerated when families enjoy the complimentary ABC Phonics instructional videos together. Katie Nelson’s Back-to-School event was a Family Scavenger Hunt to explore each area of the classroom. At one table, they received the ABC Phonics Family Reference Chart, a quick lesson on signing the first four letters, and a reminder to watch the online instructional videos. Then they moved on to find the “blue table” and perform another activity. A joyful family event! The ABC Phonics Program, and why singing and signing is so brain-friendly and powerful! 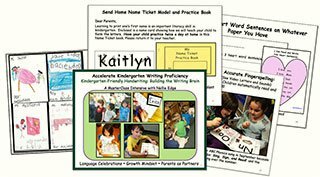 Reading at home with the “I Can Read” Poetry Notebooks and how to support the reading process. Parents responded with questions and enthusiasm.